My philosophy of teaching United States history at Western Washington University is optimistic and ambitious�and pregnant with respect for students in the learning process. Two problems drive my classroom approach to teaching history. First, most of my students have learned to hate history as one irrelevant fact after another to be mechanically memorized. Second, I have to maneuver around a large lecture hall environment within which my students assume that they will only have to be anonymous and passive note-taking sponges. However difficult, I want to instill my passionate conviction that learning and history really matter. As John Quincy Adams (brilliantly played by Anthony Hopkins) says in the movie Amistad: "We have finally come to understand: that who we were, is who we are." On a more personal level, I am vainly driven by a reoccuring nightmarish fear of being disconnected from my students and judged ultimately boring. I can only rise above my own insecurities when I place some responsibility for our mutual learning experience on my students. I therefore demand of my students that they ultimately understand that they too are historians and teachers�and have a lot to offer. They then have a reason and an obligation to be involved in their own learning. Put more crudely, during each of my American history courses I am engaged in running an intellectual boot camp. I will command intellectual push-ups and touching toes. In the end, we will all be professional historians, learners, and teachers together. Medals for valor and perseverance will be given. The classroom contract is not so much stated as practiced. Although each of my thirty or so lectures for any given course are unique in the topic covered, they all are designed with the same driving goals in mind and by the same building blocks of teaching methodology. Reinforce my stories and interpretations with multimedia. Three days of the week, I present conversational lectures during which I try to involve the students in a dialogue. The other day of the week, student volunteers take over the entire class period and lead a discussion presentation on an assigned topic for each of the weeks of the course. Each week four or five students will become expert historians and the teachers of their topic. No limits are placed on how they design their presentation or on the creativity of their teaching methods. All I ask is that they involve their fellow students: don't talk "at them," rather create an intimate meaningful dialogue. I will specifically detail how I designed and present the first two compatible lectures of my 104 class that begins in 1865. The first lecture is titled: "Reconstruction: The Unfinished Revolution." The second lecture is titled, "The Unfinished Revolution Continued: Historiography of Reconstruction and the Philosophy of History." My lecture titles always let my students know what larger historical theme I am stressing. It hints at my interpretation of the topic and the greater historical significance. All the details that follow will relate back to my one major point. Providing an interpretive theme in the title and a short outline on an overhead transparency at the beginning of class gives the students a way to organize the avalanche of information for their midterm and final tests. It also lets them know that memorizing exact topic details is much less important than their cultivating their ability to think like a professional historian. First Lecture: "Reconstruction: The Unfinished Revolution"
As the students enter class, I turn the lights low and play a 1965 audio tape of Bernice Johnson singing "Steal Away Jesus." I borrowed the title "The Unfinished Revolution" from historian Eric Foner. It implies the interpretation of the Reconstruction period after the Civil War that I want student's to grapple with and most appreciate. In order to make this point clear, I begin the class by immediately fast forwarding 100 years to the 1960s. I show a 5 minute film clip of a violent confrontation between southern whites and young Black students who are using the tactics of non-violence to stage a sit-in at a department store lunch counter in their attempt to challenge the 20C legal segregation in the South. I turn off the film and simply ask: "So, what is the question? Given what we just viewed, what do we want to know and understand in relation to the years immediately following the Civil War?" And then I wait. Eventually through conversation we begin to ask why it is that the Civil War or Reconstruction government policy after the war did not prevent the establishment of a brutal, unshakeable system of "Jim Crow" segregation in the South that would go unchallenged for some ninety years. I then phrase the question differently: "Why did we fight a Civil War during which 650,000 people died?" I ask the students to keep these historical riddles in mind for the rest of the class period. After this discussion, I again turn down the lights and give the students a graphic overview of reconstruction through a slide presentation. These are all primary document images of the time period. I show them in order to transport the students back into the past and let them live it. I invite the students to "read" and share with the class the message and meaning of each slide. For example, I show one slide that appeared in Southern newspapers in the 1860s. It is a complicated illustration of the South's depiction of the evils of Reconstruction policy. I ask the students to "unpack" all the multi-layered symbolism of the illustration. The slides lead to the defining question of the Reconstruction period that will determine whether Reconstruction would be a success or a failure. I turn up the lights and seriously ask this question of the past: "What would be the political, social, and cultural role of freedmen (ex-slaves) in the New South after the Civil War?" The class discusses this. Then I reveal the answer that the students already vaguely know. Blacks were put back into a kind of quasi-slavery that will last until the Civil Rights Movement of the 1950s and 1960s when they would act on their own behalf to resist the system of segregation that was instituted after the failure of Reconstruction policy by the end of the 1870s. To reinforce this point I have a primary document reader give a quote by the Black historian W.E.B. DuBois that succinctly states the failure of Reconstruction: "The slave went free; stood for a brief moment in the sun; then moved back again into slavery." I then back up in history by telling in story form about the assassination of Lincoln and then about Andrew Johnson instituting a lenient Reconstruction policy toward the South. I then remind the students that Congress vehemently differed with Johnson and forcefully tried to implement a Reconstruction policy in which ex-slaves' civil rights would be protected. This battle was so vigorously contested that Johnson was nearly impeached by Congress. The whole future of race relations in this country was held in the balance. I then pass out a one-page zeroxed primary document on the exact "Black Codes" of Mississippi that prove that southern whites resisted any assumption of racial equality and legally institutionalized forced labor and segregation of blacks in the South. I then have a student read a poem by Langston Hughes called I, too, sing America." 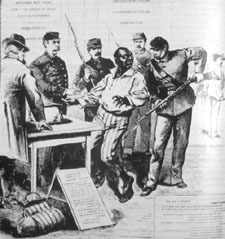 It reinforces the failure of Reconstruction from a black perspective. I ask the students to interpret this poem in relation to the theme of "The Unfinished Revolution." The student who reads Langston Hughes poem is one of three persons chosen to be "primary document readers" on the first day of class. I ask for six volunteers to audition to be readers. ("Winners" will receive course bonus points) I give them a couple of minutes to get familiar with some dramatic primary document excerpts. They then deliver their reading of the past as if they were the actual historical character. They must be loud, dramatic, and "in character." I then ask them to turn their backs to the class, and the rest of the 125 students vote on which three students of the six will be "readers" each day for the rest of the quarter. Second Lecture: "The Unfinished Revolution Continued: Historiography and The Philosophy of History"
During the next day's lecture, I deal with the connection between the philosophy of history and the subject content knowledge they now have of Reconstruction after 1865. I talk to the students about the beginning of the American Historical Association in the late 19C and William Dunning who was the preeminent authority on Reconstruction. A professor at Yale University, Dunning wrote and taught during the first decades of the 20C. He had hundreds of disciples who taught his interpretive version of Reconstruction throughout the first half of the 20C. Dunning told a story of Reconstruction very similar to the southern white perspective. It was full of evil northern carpetbaggers, vengeful northern Republican politicians, and supposed inferior ex-slaves who exercised power in the South during the first couple of decades after the Civil War. Eventually, according to Dunning white southerners were able to throw off this corrupt regime and rightfully regain power in the South. Dunning's interpretation influenced the history profession and public school textbooks until the Civil Rights Movement of the 1950s and 1960s forced a reinterpretation - a "New History" - that completely contradicted and dethroned Dunning's "Old History." To make this point clear, I have a student read from a 1930's high school textbook that exactly mirrors Dunning's old version of slavery and Reconstruction. I then turn down the lights and show a ten minute film clip from Birth of a Nation, the 1914 silent film blockbuster by D.W. Griffith. I first apologize for showing them such a racist, insulting interpretation of black-white relations during Reconstruction. I remind the students that they will find the images shocking and degrading, but that people at the time would have been thoroughly entertained and would have considered the film's message "normal" and consistent with their world view. In the ten minute clip the complete old history of Reconstruction is dramatically detailed. Southern whites, rather than ex-slave Blacks, are the victims of Northern vengeance and Black ignorance. It ends with the necessary founding of the Ku Klux Klan in order to restore white Southern supremacy. I use the film clip to open up a discussion with the students about the philosophy of history. I reveal to them that D.W. Griffith�who after all was only borrowing an interpretation of Reconstruction history made credible by historian William Dunning and others�absolutely believed that he was telling an honest history free from bias. Dunning too believed in his own complete historical impartiality. He even wrote a philosophical book entitled The Truth of History in which he celebrated the history profession's near achievement of empirical objectivity. Given that Dunning had got it all wrong from our modern perspective, we as a class talk about the problematic nature of achieving objectivity in history and how it is that historical interpretations can change over time. I then tell my students about the revolution currently taking place in the history profession and that the "New History" owes much to our rethinking of race relations during slavery and Reconstruction. No part of American history has been more riddled with bias than Black history. In the last 20-30 years Black voices have been included onto the center stage of history. This has radically altered our understanding of all United States' history. I end by telling in story form about the deadlocked Election of 1876. Rutherford B. Hayes was given the presidency when he agreed to pull troops out of the South. This "Compromise of 1877" allowed southern whites to regain power. The South soon became a racially segregated society and sanctioned terror would keep blacks in their place until blacks dared to challenge the system in the 1950s. Always wanting to make history more relevant to students, I ask the students to draw comparisons to the present. They discuss the similarities of the electoral college problems of 1876 and the Bush/Gore election of 2000. After having told them that Andrew Johnson was nearly impeached in 1868, the class also discusses the relative importance of Bill Clinton's more recent near impeachment. Student Led Discussion Presentation on Coming of Age in Mississippi, and the Civil Rights Movement of the 1950s and 1960s. Later in the quarter, four or five students take over an entire class period to present their original research into the Civil Rights Movement. It builds on our discussion of Reconstruction: the Unfinished Revolution and the philosophy of history. 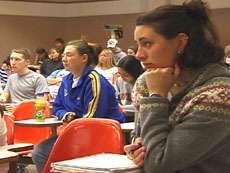 It is partly their responsibility to explore with their fellow students the meaning of the class assigned autobiography of Anne Moody, her Coming of Age in Mississippi in the 1950s, and her eventual disillusionment with the Civil Rights Movement's goal of integration and the strategy of non-violence. The student discussion group leaders will have worked for weeks researching, finding primary documents, and thinking about this topic. Despite all of their exhaustive work and preparation, they are invariably scared. After all, they don't want to embarrass themselves in front of 125 of their peers. All the burdens of being historians and teachers rest on their shoulders. But they know it's "showtime." All along, they have been encouraged to become expert historians in their field of study, freed to be as creative in their teaching methodology as they like, and primed to get their fellow students involved in an active interaction about this topic and the history profession in general.